AffordablePapers.com is a professional writing service that delivers various types of academic content to students at different levels. As the company’s name implies, the services are affordable considering the industry’s average. The quality of content cannot be compared to the one achieved by top-rated services, but this is a solid choice for students who don’t need complicated papers and want to get somewhat cheaper writing assistance. The customer support department is not available non-stop, so the customers who need revisions usually have to wait longer before getting the amended versions of their papers. Writing assistance – you can order any type of essay, article review, annotated bibliography, coursework, capstone project, creative writing or critical thinking assignment, business plan, dissertation, movie/book review, admission essay, thesis, research proposal, research paper, and other types of academic content. The option other enables you to provide specific instructions about an unusual project. Since the company has hired writers qualified in different academic areas, you can get a suitable writer to work on your project. Editing, proofreading, and formatting services are not available at this website. The fact that the company hasn’t invested in an editing team is an issue, since the writers’ work isn’t check by professional editors. Depending on the type of paper you want to order, the price will vary. The other factors that influence the final cost are the number of pages you want to get, the urgency of your paper, and the quality level you choose. You won’t pay a high price for a paper ordered at AffordablePapers.com. The quotes per page are low, but you should pay attention to the fact that you cannot set a deadline shorter than 8 hours. That being said, this website is not the best choice when you need an extremely urgent paper with top quality. The deadlines range from 1 month (which is available only for University level) to 8 hours. The available academic levels are School, College, and University. School is the least expensive option, with quotes per page ranging from $9 for the deadline of 7 days to $22 for the 8-hour deadline. The quotes for College level go up to $25, whereas University is the most expensive option with prices that go up to $32. All prices are given in US dollars and you cannot get them converted directly at the website. That’s a serious inconvenience for international customers. You won’t get discounts at this website, but you will get the following free features: bibliography page, revisions, formatting, and delivery. Although the company guarantees 24/7 online customer support, the live chat is not non-stop available. The customers are misinformed that the chat working hours are from Monday 00:00 AM to Saturday 01:00 PM (UTC), but you can easily notice that the representatives are not always online during that time. The other contact options are email and phone. BuyAssignment.com is a custom writing service that is not trying to attract attention with some extraordinary web design, but with strong guarantees and a versatile range of services. Although the website looks plain, you’ll find it quite informative. However, there is no justification for the lack of a mobile version. Since you won’t be able to navigate the site from your smartphone, you cannot order papers on the go. Homework writing – a category that includes different types of products, depending on the subject and project you are working on. Essay writing – all types of essays are available for order. Assignment writing – this is another category that includes different kinds of academic projects. All these products are available in different niches, since the company has hired writers with degrees in several disciplines. The order form features other types of documents as well, such as book report, movie review, article, research proposal, and more. BuyAssignment.com adheres to an affordable pricing policy that enables every student to get a decent paper online. As usual, the final price depends upon the quality level, type of paper, length, and urgency of the project. Although you won’t find a detailed price chart at the website, you’ll get separate quotes for all combinations of deadline and quality in the form featured on the Prices page. The available quality levels are Standard and Premium for the usual types of papers. If you want to order a dissertation, you’ll be able to choose among Undergraduate, Master and Ph.D. level. The urgency options for essays range from 10 days to 24 hours. When compared to the top-rated companies in the industry, this service is not the most beneficial choice for extremely urgent papers. 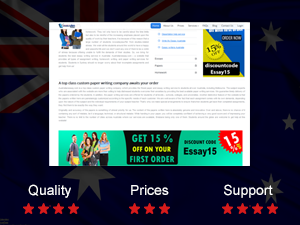 The prices for essays range from $12.99 to $26.98 per page (the quotes are expressed in US dollars and you won’t get an instant estimation in another currency). Dissertations are available with deadlines from 2 months to 7 days, and cost from $14.99 to $23.99 per page. All new customers can use a discount code that will reduce the final price for 15%. The company also provides discounts for customers who order 10-15 pages per assignment, but doesn’t specify the exact price reduction. It remains unclear if loyal users get any benefits at this website. Information about free features is not available. The customer support on this website is decent. There is a live chat feature that enables you to contact a representative without any delays. In addition, BuyAssignment.com also enables its customers to reach an agent via phone and email. You can ask any question before or after ordering the paper, so the entire ordering experience gets more convenient thanks to the effective support. The name of EssayCorp may sound outdated, but it does offer a wide range of custom writing services that fit into students’ needs. The team didn’t bother much about the design of the website they built as it is poorly constructed and the written content looks like it was written by a person with English as a third language. Luckily for you, the person that wrote their website content does not work as an academic writer. This is a relatively popular writing service among Australian students, which is weird because the website is terrible and features absurd text. The founders could have invested more effort and money on the website because the content and the design are both terrible. They have a few writers that are good at things such as dissertations, but mostly their writers are qualified for doing homework. They are the sort of writers you can trust to do your homework, but that you may think twice about doing your coursework. If you are looking for them to do your coursework, then pay the higher band prices so they only put fully quailed and experienced people on your project. 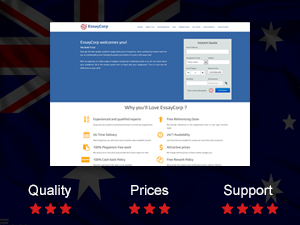 With this company you get what you pay for, which means if you pay the lowest prices, you get the lowest quality. It’s always exciting to see a fresh writing service specifically devoted to a particular type of assignments. As the name itself implies, GuruDissertation is an agency focused on delivering dissertations on different topics. Although the company offers other types of services as well, PhD projects are its main focus. The website is slightly confusing, since you cannot find the terms and conditions, guarantees, and prices of the company. You would have to contact the agents of the customer support department to the information you need. That’s really inconvenient when you want to place an order ASAP. On the bright side, the company delivers decent quality to its customers. Dissertation editing and writing assistance is the highlight of this company. You won’t find a specific list of services at the website. There are different pages with lengthy pieces of text, which don’t clarify exactly what you can order at the website. GuruDissertation could definitely work more on its transparency. The order form, however, is very clear. You don’t have to subscribe with an email address to get access to the complete form. You will find several types of papers listed as options: essay, article, annotated bibliography, research paper, math problem, movie review, case study, term paper, and many other types of academic content. As we can see, the offer of the company is not solely limited to dissertations. As for PhD projects, you can order the entire paper or separate chapters that would fit into the work you’ve already completed. Unfortunately, you won’t find a clear price list at this website. GuruDissertation.com is not the most transparent service out there, so you’ll have to access the order form to see how much your project is going to cost. That’s not such a problem, since the form automatically calculates the cost of your order before you submit it for good. The prices for high quality are relatively affordable, but the premium quality level is really expensive when compared to other website (it’s charged double than the high quality option). The available deadlines for essay start from 20 days and go up to 3 hours. The lowest quote per page for this type of project is $11.30 (high school level with a 20-day deadline), but the price goes up to $89.90 for PhD level of premium quality with a deadline of 3 hours. That’s a really expensive price to pay for a simple essay. Dissertations cost from $14.95 to $71.90 per page. The available levels for this type of project are Undergraduate, Master, and PhD. Don’t expect to find any discounts at this service; there isn’t such a program. If you want to order a paper from GuruDissertation, you’ll have to go for the full price. The live chat feature is available 24/7, so you can easily get in touch with an agent. That’s a good thing, since you’ll definitely need to contact the support to get more information before placing an order. Since the terms and conditions are not available at the site, you need to get the details about revisions, refunds, direct contact with the writer, and other policies.